Train as a SMC Full Circle Doula Birth Companion and receive dual certification as a labor and postpartum doula. 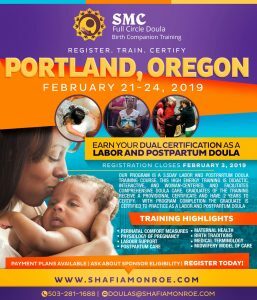 This training designed to honor the legacy of the 20th Century African American midwife, the history of the doula, physiological birth, the midwifery model of care, breastfeeding support and honoring the father. Learn public health, hands on care, and infant and maternal mortality prevention models, postpartum rituals, and how to create a doula business. Read More.